What exactly has been going on behind the scenes at the Melreese golf course in Miami? City of Miami officials are seeking to find out. The city-owned property, about 131 acres with an 18-hole golf course, has been thrust into the spotlight this summer after David Beckham and his business partners showed an interest in securing the site for redevelopment and home to a new professional soccer team. 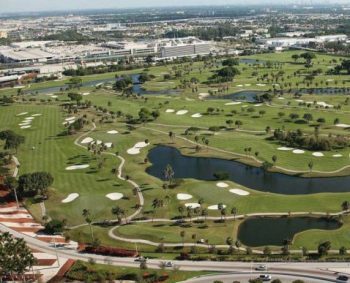 While the property at 1400 NW 37th Ave. is publicly owned, private DeLucca Enterprises runs the golf course under a contract with the city. Financial questions arose recently when city commissioners began debating a proposal from Miami Freedom Park LLC (Beckham’s group) to lease the golf course for a new multi-use office tech campus with hotel, retail and restaurants and anchored by a 25,000-seat soccer stadium for the Beckham Major League Soccer team. At their July 26 meeting, commissioners voted to direct the city’s independent auditor general “to conduct an audit of any and all financial matters involving the operations and management of the City of Miami’s Melreese Golf Complex operated and managed by DeLucca Enterprises Inc.,” further directing the auditor general provide the results of the audit to the city commission. The move comes one week after the commission, on a split 3-to-2 vote, approved placing the Miami Freedom Park proposal on the Nov. 6 ballot for city voters to decide. The action came at a special meeting July 18. The deal includes creation of a Park Infrastructure Fund by the city to which Miami Freedom Park would make a $20 million contribution (payable in equal yearly installments for 30 years) to defray the site development and other infrastructure-related costs for a public park of about 58 acres to be developed on adjacent property, currently used for the Melreese Country Club. The city-owned property is bordered on the east by Northwest 37th Avenue, on the south by Northwest 14th Street, and on the west by Northwest 42nd Avenue. It hugs the city’s Grapeland Water Park, and is next door to Miami International Airport. At the July 18 meeting, as commissioners argued for and against sending the matter to a vote in November, Commissioner Joe Carollo was critical of the operations at the city-owned property. “We keep talking about now. We don’t want to talk about the past, what’s been going on there. You can say you want transparency now, but I want to look at transparency in the past and now,” said Mr. Carollo. In response to those opposed to the Miami Freedom Park proposal, who say it’s wrong to give open green space and public park land to a private developer, Mr. Carollo said the property is not a public park used by the average city resident. “It’s a myth that this is a public park. This is a private country club,” Mr. Carollo said, estimating that 95% of the people who use the golf course don’t live in the city. He spoke of a sign at the entrance of Melreese Country Club that says jogging is not allowed, along with other activities. “What park in the world is a park you can’t jog in? No fishing. No walking on golf course. What park in the world says you can’t go walking in? No personal coolers. How can you have a picnic?” asked Mr. Carollo. As he has on several issues since taking office in late 2017, Mr. Carollo said he’s working to improve the lives of the average city resident. “I assure you, I will fight with everything I have to give to real taxpayers of Miami that piece of land back to them, and work for those Miami jobs and dollars it can possibly bring,” he said. Mr. Beckham’s group is promising a world-class soccer village and technology hub, 110 acres of permanent green space, 23 acres of youth soccer fields, 2,300 permanent jobs, and $40-plus million annual tax revenue for the city, county, state and school board. Mr. Carollo listed several business entities that have filed paperwork with the state using the golf course address. Those he cited included: Florida Football Association; DeLucca Mini Soccer Magnet LLC; Tina’s Touch Inc.; DeLucca Surfaces Inc.; DeLucca Enterprises Inc.; Charlie DeLucca’s School of Golf; The First Tee Of Miami-Dade Inc.; Bunkers Inc.; and others. Commission Chairman Keon Hardemon was upset by the revelation. “This is the first time hearing this and it’s very shocking,” he said. “Arguably, there are many things going on there than the city is aware of,” said City Attorney Victoria Mendez. City voters will decide in November whether to authorize the city to negotiate an agreement for the development of Miami Freedom Park. At the special meeting July 18, Mr. Hardemon, Ken Russell and Mr. Carollo voted in favor of the referendum, while Wifredo “Willy” Gort and Manolo Reyes voted against. Joe Carroll in bed with developers. What a surprise! So let’s shut down all the libraries which lose money and serve a relatively few people. Do we need another shopping center? Is the future of Miami to have no green space? Why a no-bid contract? Can you say “banana republic”? How many people do the libraries serve? The city is essentially paying for the stadium itself with the big land and zoning give away, and getting relatively little in return. It’s an easy “NO” vote. It is obvious that Joe Carollo is making money off of this deal, both him and Jorge Mas confirmed that this was his idea to begin with. Everyone needs to stop pretending that what they are building has anything to do with soccer because it simply doesn’t. This is just a ploy to give public land to developers in order to build another horrendous shopping mall. Meanwhile, they are way overshooting their projected revenues because brick and mortar is no longer surviving, online shopping is closing malls and institutions all over the US (just look at Toys R Us). Not to mention that the majority of those who can afford high end stores will drive an extra 10 minutes to Merrick Park (this goes for dining as well). In the end, this will cost us all money when those stores start going out of business and that mega mall starts to suffer. If they do not have the revenue to lease the land and continue with the maintenance of the “park” they will have I can guarantee that it will fall on us as taxpayers. If the city doesn’t want that land to remain a golf course (suddenly now, after 60 + years), then turn the ENTIRE property into a public park. Park land should be considered sacred ground to be preserved and protected, not turned over to private developers.